2751 Private Thomas Fairhurst, 1/6th Battalion, Durham Light Infantry died of wounds 19 October 1915. He is buried at Cabaret-Rouge British Cemetery, Souchez, France and commemorated on the St. Helens Colliery Memorial Cottages. He was 21 years old. 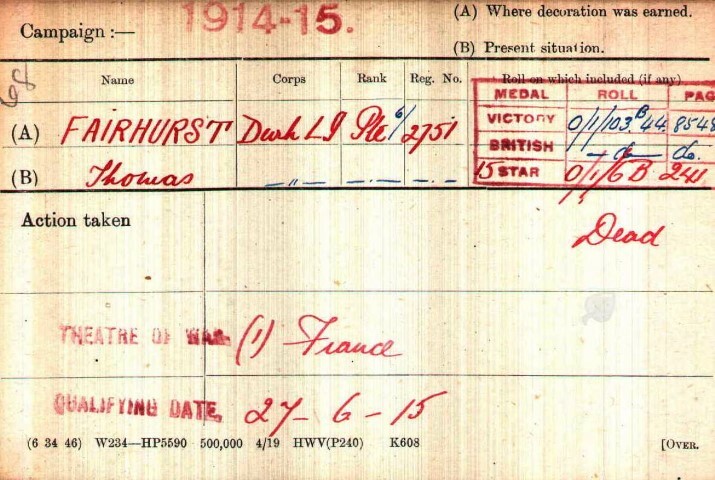 The service record of Private Thomas Fairhurst or the 1/6th DLI War Diary have not been researched. Captain R.B. Ainsworth  and Harry Moses  publications have been used as primary sources. Private T. Fairhurst entered France 27 June 1915. 6/DLI was in a quiet sector of the front, Kemmel to Armentieres where the battalion occupied trenches in front of Kemmel Hill, known as Regent Street. 17 July: Armentieres reached. Billets at Blue Blind Factory. The pattern of life in and out of the trenches continued until 10 November 1915 when the battalion was relieved and marched to billets at La Creche, near Bailleul where it stayed for a month enjoying its first rest since embarkation. Private Fairhurst didn’t make it. Was this 2751 Private T. Fairhurst? 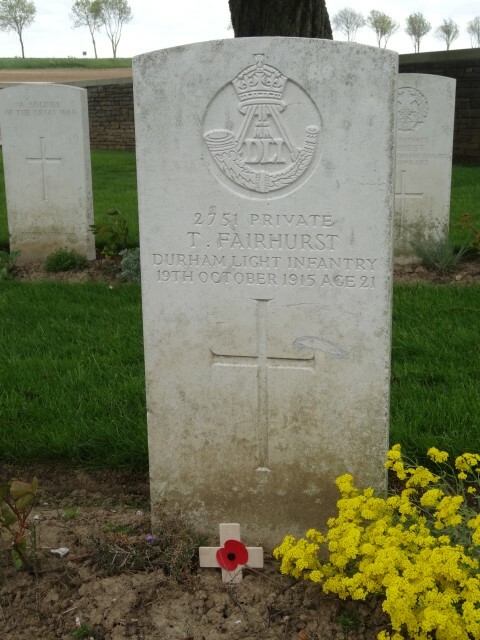 CWGC gives the date of death for 2751 Private Fairhurst as 19 October 1915. SDGW accords with this date and records his death as “Died of Wounds.” Perhaps an explanation could be that (if it is indeed the same soldier) at a later date, the patrol returned with Private Fairhurst wounded and he died later. This may not have been reported in the battalion war diary. 2751 Private Thomas Fairhurst was awarded the 1915 Star, the British War and Victory medals.